4969 ✉ W2.12 Aquadent - 5 Pfg. 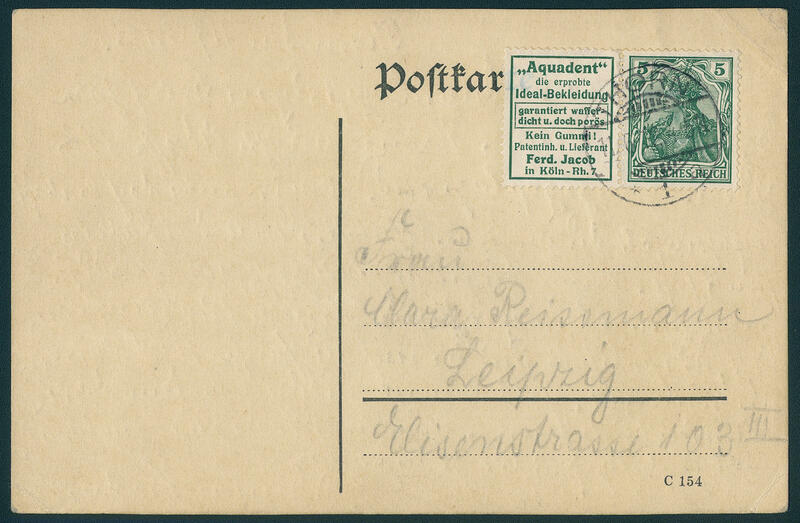 Germania, horizontal se-tenant, wonderful fresh colors and in perfect condition on very nice correctly franked postcard, perfect used \"THORN 11.6.12. 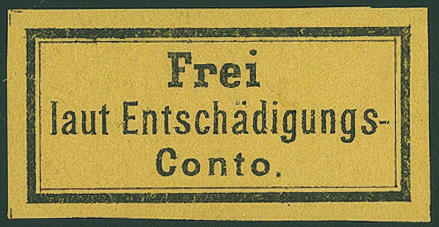 \" to Leipzig. An exceptional fine example and very rare! 4970 W2.13 Photograph papers satrap - 5 Pfg. 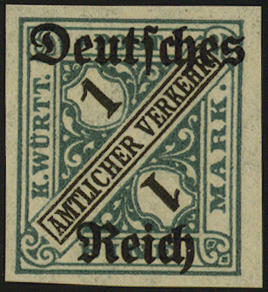 Germania, horizontal se-tenant wonderful fresh colors and in perfect condition unused. 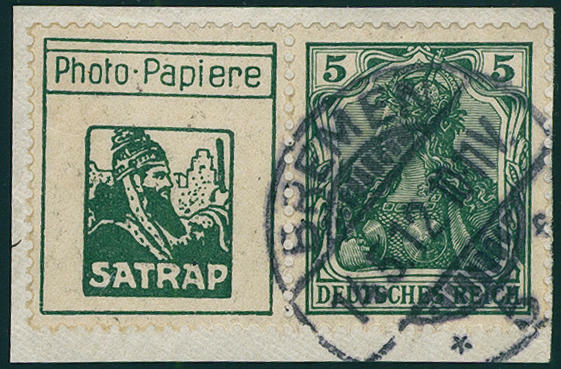 4971 ∆ W2.13 Satrap photograph papers (small head) - 5 Pfg. 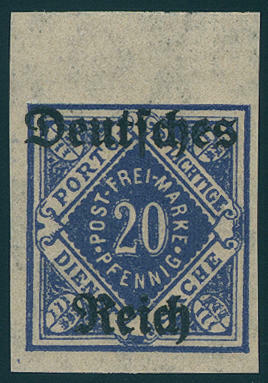 Germania, horizontal se-tenant fresh colors and in perfect condition on very nice white letter piece with neat postmark \"BREMEN 14.5.12. \". Outstanding quality! 4972 ⊙ W3.25 Limania-10 Pfg. 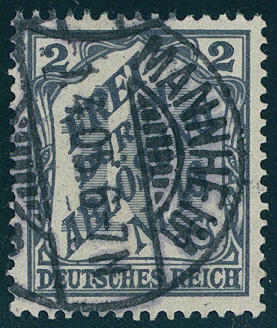 Germania, horizontal se-tenant from left margin, very fine and neat cancelled \"ESSEN\", unfolded and in perfect condition. 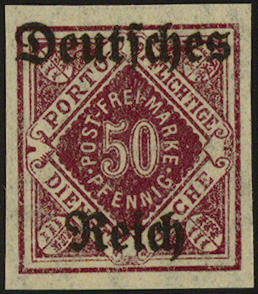 4896 I Free according to recompense Conto 1874, wonderful fresh colors and large margins all around, unused with original gumming. A very scarce issue! Michel 700,- €. 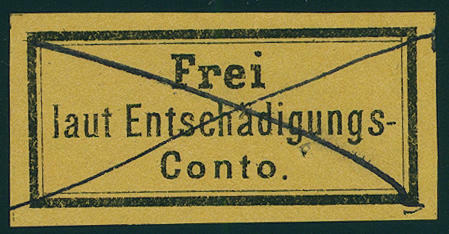 4897 I Fee label 1874 black on yellow, fresh colors and good margins, in perfect condition unused with full original gum. In this preservation a scarce issue. Photo expertize \"perfect quality\" Grabowski. Michel 700,- €. 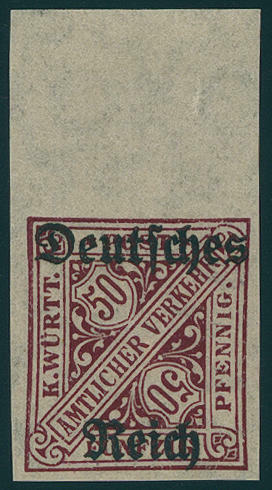 4898 ⊙ I Fee label 1874, fresh colors and large margins all around with stroke of pen cancellation in perfect condition, expertized Hennies BPP. 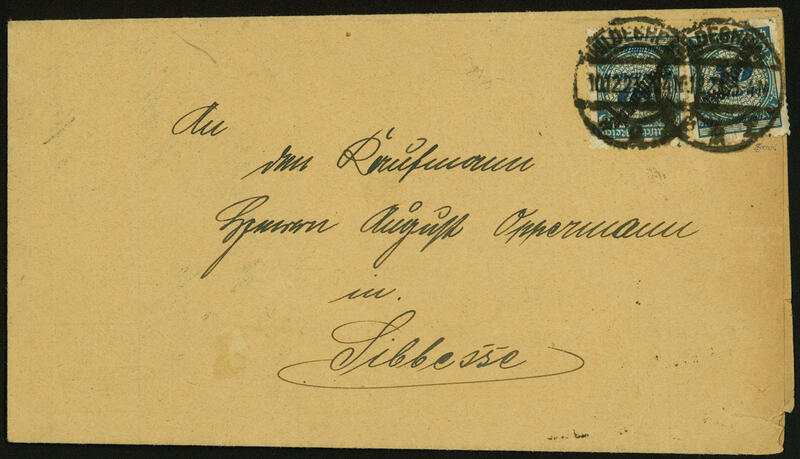 4899 ✉ I \"free according to recompense CONTO\", fee label for official letters of the railroad black on yellow, fresh colors and with wide margins in perfect condition on package card with accordingly seal oblate and turning into single circle postmark \"Cologne 2.5.83. 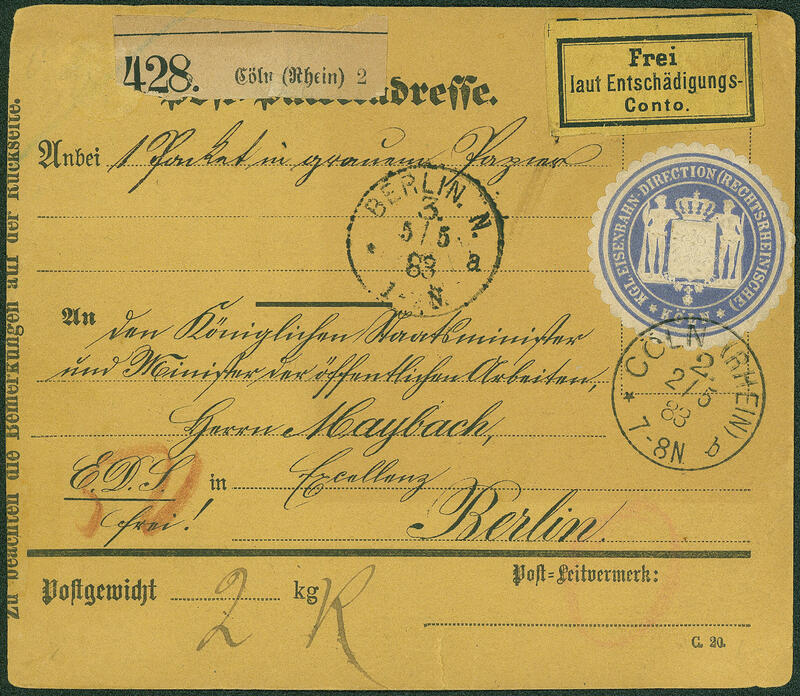 \" to Berlin with arrival postmark. 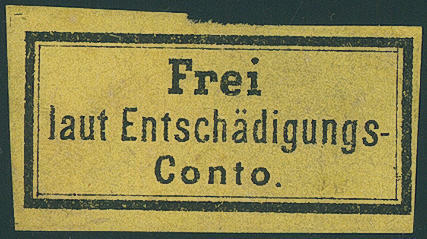 This fee label was almost only on covers used. 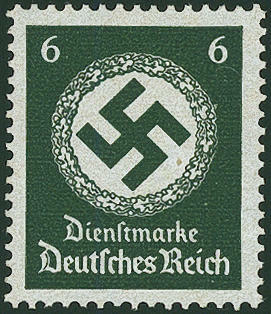 On package card is an important rarity, whereby the example shown here is particularly attractive. Photo expertize Wiegand BPP. 4900 ⊙ 9 2 Pfg. 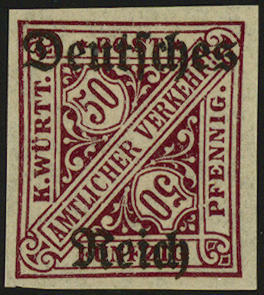 Issue for Baden, four piece, neat cancelled \"MANNHEIM\". Michel 400,- €. 4901 ⊙ 19b 20 Pfg. 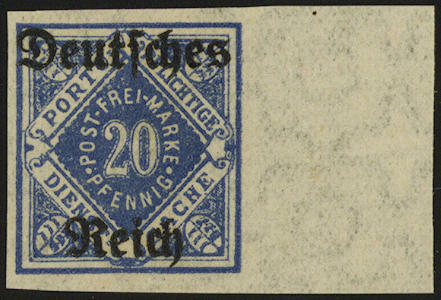 Prussian blue, fresh colors and very well perforated, neat cancelled \"GLOGAU\" in perfect condition. 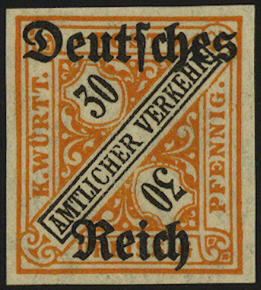 A very nice copy of this rare colour! Photo expertize Winkler BPP. 4902 34/51 Official stamps 1920, 20 sets, almost everything in multiples, in perfect condition mint never hinged Michel 1700,- €. 4903 52/56U Official stamps series 1920, all five values four sides unperforated, fresh colors and in perfect condition mint never hinged In this excellent condition a very scarce issue! Expertized Peschl BPP. Michel 1350,- €. 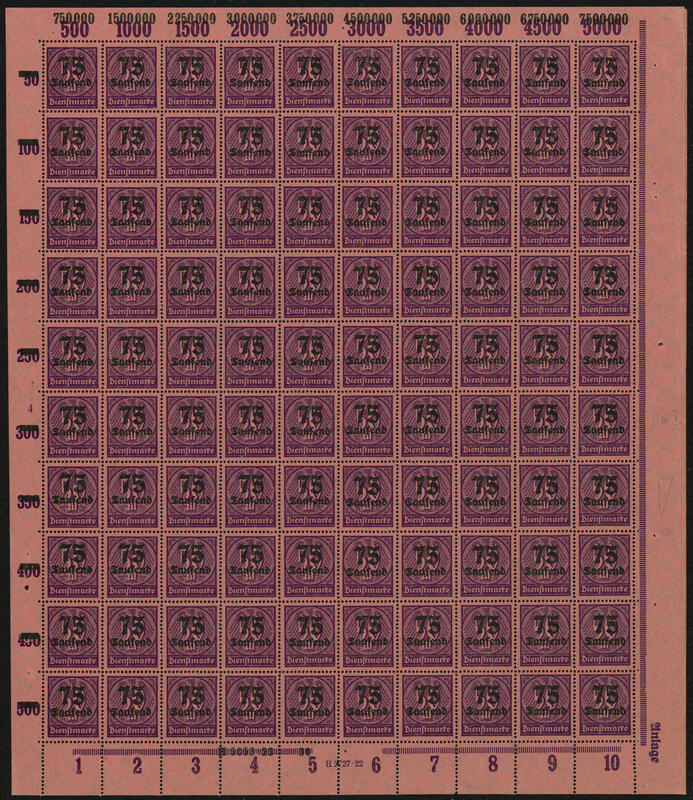 4904 52/56U Official stamps set 1920 complete four sides unperforated, as well 20 Pfg. With both watermark, except for 50 Pfg. 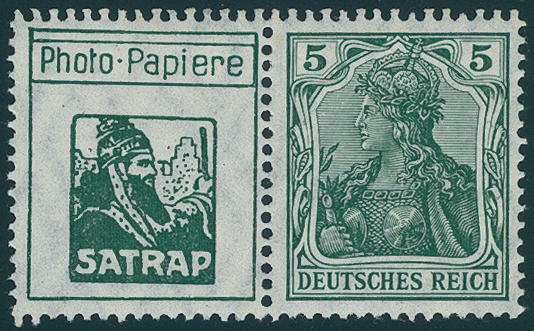 All from margin of sheet, in perfect condition mint never hinged, expertized Infla / Berlin, Peschl BPP. Michel 1.650,- €. 4905 55YU 20 Pfg. Dark ultramarine, watermark rings, four sides unperforated, fresh colors and in perfect condition mint never hinged, without any signs. Michel 300,- €. 4906 57/64U Official stamps series 1920, all eight values four sides unperforated uniform from upper margin, wonderful fresh colors and in perfect condition mint never hinged (also in the margin of sheet). In this excellent quality a scarce set! Expertized Peschl BPP. Michel 1400,- €. 4907 57/64U Official stamps 1920, all 7 known unperforated values (20 Pfg. 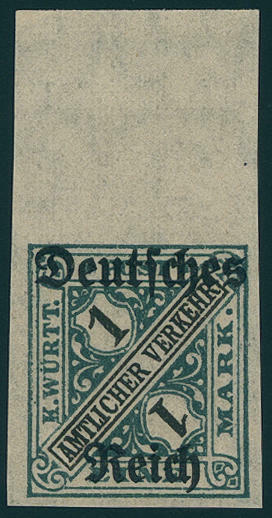 Both watermark), wonderful fresh colors, in perfect condition mint never hinged in perfect condition, very scarce issue, expertized Klinkhammer BPP, Bechtold BPP. Michel 1,900.- €. 4908 ✉ 88 50 Billions Mk. 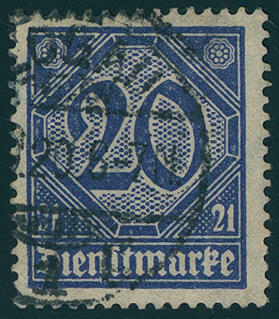 Snake imprint, horizontal pair as extremely rare, correctly franked multiple franking, right value to the margin fixed (perforation little nicked), with clear two ring cancel \"HILDESHEIM 10.12.23\" to Sibbesse. 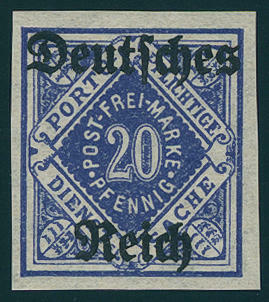 A significant rarity of the inflation period issues and in the rarity list Infla / Berlin under of the number C27 indicates. Photo expertize Dr. Düntsch BPP. 4909 91DD 75 Tsd. On 50 Mk. 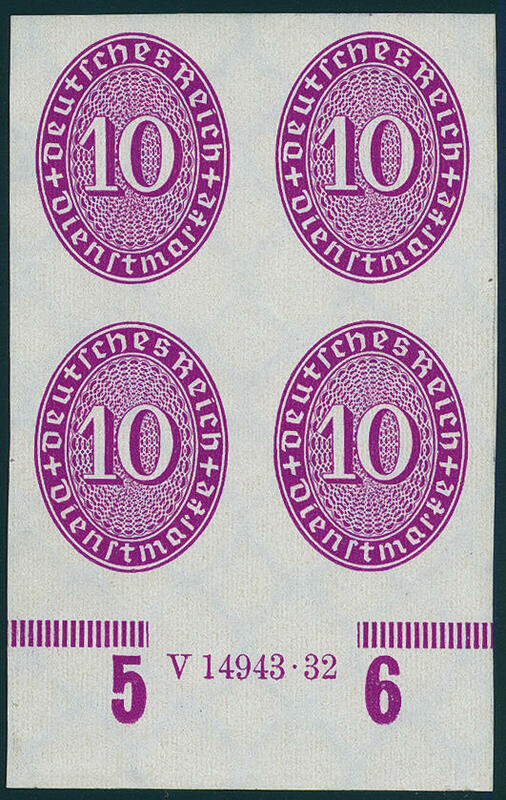 In the complete original sheet to 100 values showing a double print of the overprint, of it one in the blind embossed, in perfect condition mint never hinged an interesting variety, the in the year 2000 discovers was, by Michel catalogue up to now unlisted. Rarity for specialists or to the Distribution. Corresponding write Winkler BPP. 4910 125XUHAN 10 Pfg. 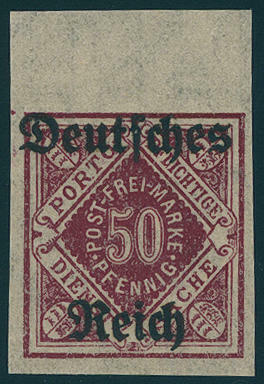 Purple, the so-called \"straw hat pattern\" unperforated block of four from lower margin with house order number \"V14943.32\", fresh colors and in perfect condition mint never hinged a spectacular varieties rarity of the German Reich and in this kind probable unique! A Honor for the sophisticated special collection from excellent quality. Photo expertize \"the quality is perfect\" Hans-Dieter Schlegel BPP.